The time had come to visit a definite mountain country - Switzerland. With the good experiences from Germany and Austria, it should come as no surprise that yet another German-speaking country would be a pleasant one to visit. It is rumoured to be rather expensive, and it is indeed, but prices aren't necessarily that much higher than some other expensive places. The plane trip to Zürich was done in little more than 2 hours, a pleasantly short trip. Once there, it took quite some time to pick up the car as the ones ahead in the line seemed to be going through the entire set of rules, regulations and car sortiment before they were done. Finally the car was picked up - a Ford Focus automatic - a nice vehicle indeed, and it was pretty much a virgin car at only 2 months. The Mövenpick Hotel Glattbrugg - Zürich was an excellent choice after the trip. As part of a room upgrade, they offered a welcome drink - sparkling wine, which was enjoyed in the hotel reception area while watching the other tourists arriving or milling about. The room was large and had two queen sized beds as well as air conditioning, which is a good idea considering the location near the autobahn between the airport and the city itself. Breakfast consisted of more than 80 varieties of edible stuff, selection wise top notch, yet set us back CHF 29 per person. The breakfast room is turned into a restaurant later in the day, and right next to it (slightly hard to spot) is an optional dining place - the Dim Sum chinese restaurant. They had lemon sauce chicken - yummy! The plan for the day was to drive into Luzern and stop for some short sightseeing, then possibly visit mount Pilatus and try out the world's steepest cogwheel train. However, as we neared Luzern, thunder and lightning hit the sky in between threatening dark blue-grey clouds which dropped quite large amounts of water as well. Mount Pilatus was skipped entirely, and a relatively short sightseeing trip in Luzern was done. It consisted of a stroll along the wooden Kapellbrücke (Chapel Bridge) across the river - beautifull decorated along one side with tons of flowers, and a visit to the Löwendenkmal. The latter is in memory of hundreds of Swiss Guards who were massacred in during the French Revolution. Lunch was enjoyed underground at the main railway station. The autobahns or motorways in Switzerland are of an excellent standard, and the traffic isn't very dense, considering the relatively small area of the country compared to its 7 million inhabitants. Tunnels are excellently lit and several even have white glazed tiles. The route towards the Bernese Alps continued onto a smaller main road and took us through a lush green valley which resembled one found in Norway a lot. Across the Brünig pass at 1008 metres, you are rewarded by small glimpses of the eastern of the two lakes which make up the Interlaken area (Brienzersee to the east, Thunersee to the west). An optional stop along Brienzersee is Giessbach with its (for us spoiled people from the north) not too impressive waterfall. Continuing south near the town of Interlaken, nestled between the two lakes, we made a short stop at Wilderswil's small train station. 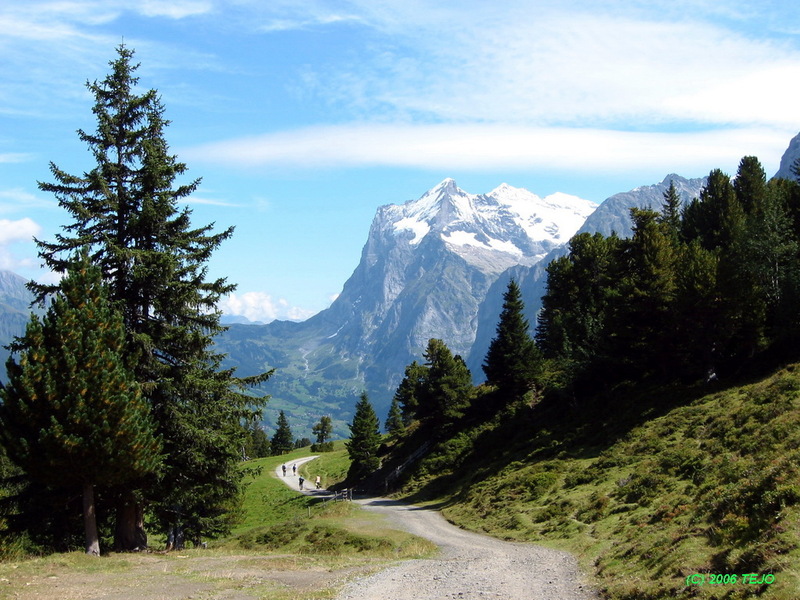 From here, trains from Interlaken leave for Lauterbrunnen (right below Wengen) or Grindelwald, and there is a separate rack railway leading up to Schynige Platte at 1967 metres, from where there is an excellent view of the Bernese Alps. The room didn't at first seem very impressive (but was nice once we got used to it), but we chose to stay here anyway, as the location was excellent - quiet, and with a great view of the Eiger (if the rain would stop). Dinner was enjoyed at the local chinese restaurant, which needed some navigating to find, due to a somewhat confusing sign. The next day we woke up to..heavy fog, but no rain? Wait..there's a clear blue sky above that thick layer of fog..and above that layer of fog, a shining white Eiger peak rose. I have seen my share of mountains before, but this one was indescribably impressive, possibly due to the height difference. The hotel is situated somewhere in height between the railway stations of Grund (950 m) and Grindelwald (1034 m), and the peak of the Eiger rose almost 3 kilometres above. Eventually the fog lifted entirely, revealing the surrounding mountains, and they were indeed an impressive sight. 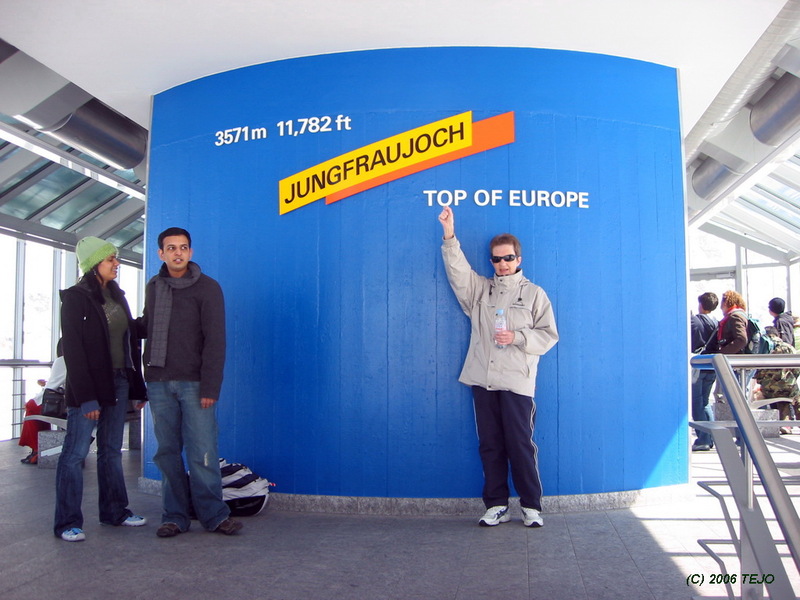 This was definitely the day to go up to the Jungfraujoch (aptly named Top of Europe), the highest situated railway station in Europe at 3454 metres above sea level. The journey up there is done in two legs: first from Grindelwald (or Grund in our case) to Kleine Scheidegg at 2061 metres. 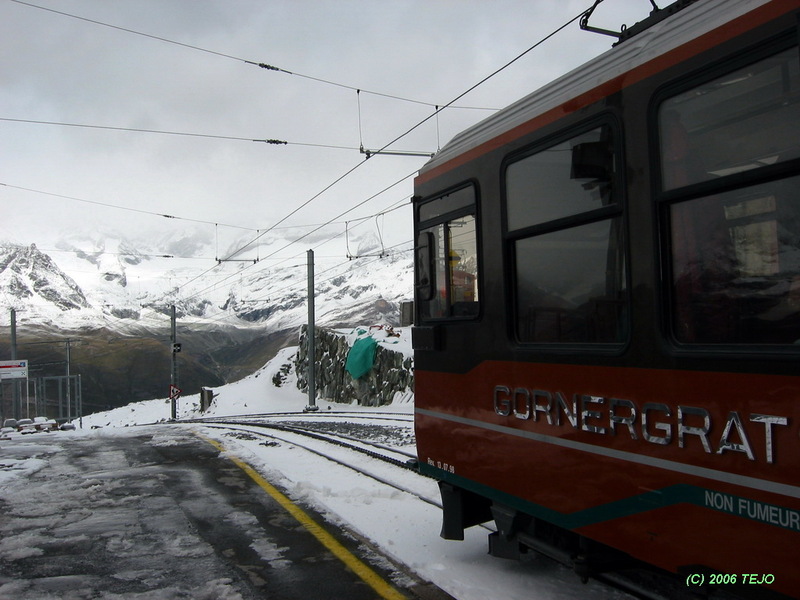 This small plateau is the meeting point between three rack railway lines - from Grindelwald, Wengen, and Jungfraujoch. At Kleine Scheidegg you are greeted by a fantastic view of the 'famous trio': Eiger (3970 m), Mönch (4099 m) and Jungfrau (4158 m). The line continues to the left with Schreckhorn (4078 m) and Wetterhorn (3701 m). Behind Schreckhorn but not visible from Kleine Scheidegg is the highest mountain in these parts of the Swiss Alps - Finsteraarhorn (4274 m). The extension of the Swiss railway system is very impressive - there are 26 individual privately-owned companies in addition to the national one. At Kleine Scheidegg, you switch from Wengernalpbahn to Jungfraubahnen for the final leg, which goes first up to Eigergletscher (2320 m), where one can hop off and walk the 'Eiger trail'. From here, the train dives into the Eiger itself and winds its way up, stops for a scenic view from inside the north wall - Eigerwand (2864 m), crosses the entire mountain to the back side out into Eismeer (3158 m) where one has a marvellous view of the glacier and Finseraarhorn, before finally reaching its endpoint through a long tunnel at Jungfraujoch (3454 m). 80% of the entire stretch goes through tunnels, and everything was done nearly 100 years ago! 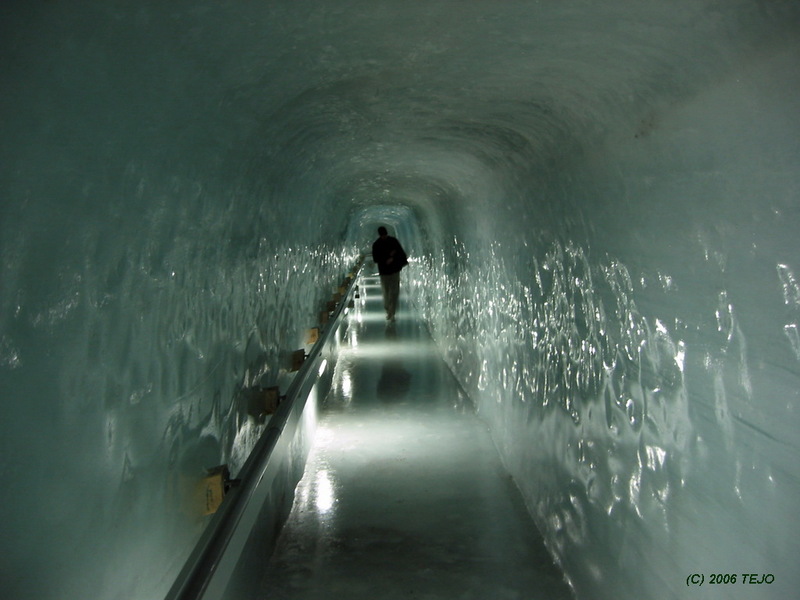 At the station, it is well worth visiting the 'Ice Palace', where various figures have been carved out in ice. Be careful when walking, as the entire floor, walls and ceiling is made of ice! A short walk, an elevator ride, and some steps, and the definite 'Top of Europe' has been reached - the Sphinx at 3571 metres. At this height, it is quite possible to suffer slightly from the lack of oxygen, and it is advisable to walk slowly and bring some bottled water. 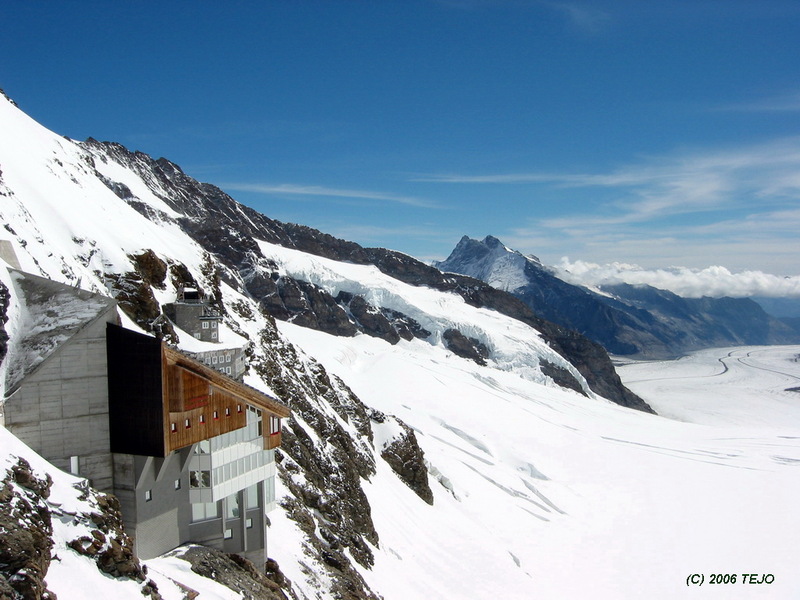 The view from the top is spectacular across the surrounding mountains, nestled in between Mönch and Jungfrau. On the back side, the Aletschgletscher stretches into the distance. The entire area is a UNESCO Natural Heritage site. The Eiger is also one of Europe's most famous climbing mountains, especially the north wall. 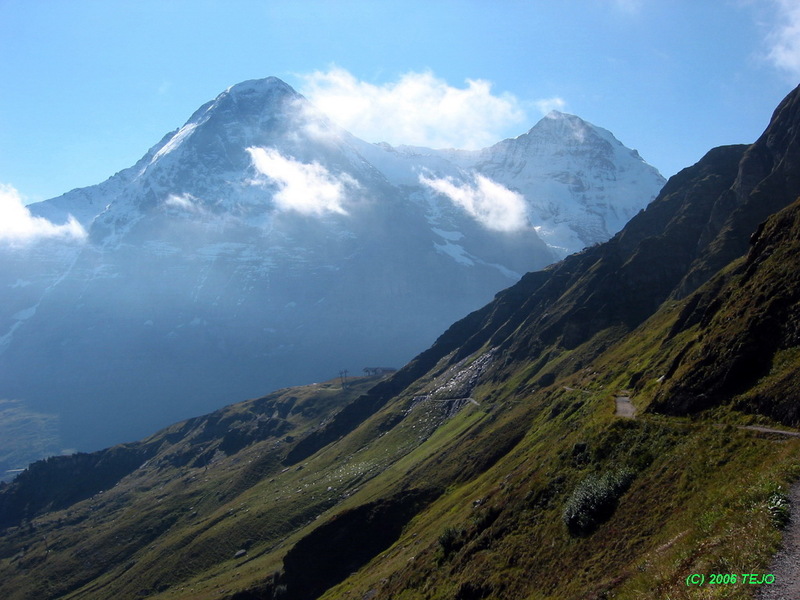 The name of the trio of mountains comes from an old legend, where the ogre (Eiger) tries to steal the virgin (Jungfrau), who is in turn protected by - and thus placed between them - the monk (Mönch). Be prepared to set aside most of the day for this trip, as the train journey alone takes around 4 hours. Dinner was enjoyed in an Italian restaurant for a change, at the Best Western Hotel Spinne. Here, they explained that July had been extremely hot and August extremely wet. Not too promising..but the day was great even though some clouds drifted in from below. Tiramisu for dessert..these portions are really too big..and a Swiss speciality - Ovomaltine, a sort of hot chocolate but with a different taste since it contains malt, among other things. This day seemed very promising, and at 9:30 Elvis left the building to stroll down past Grund station towards Männlichenbahn. 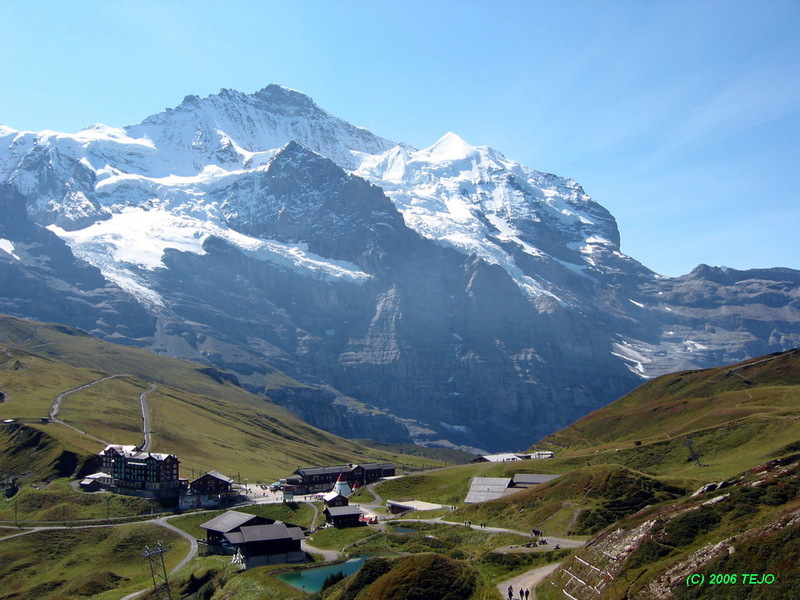 The goal for the day would be the hike known as 'Der Klassiker', estimated walking time of around 1,5 hours from Männlichen to Kleine Scheidegg. The Männlichenbahn is a neat cable car that will take you up to an altitude of 2225 metres in around half an hour. The ticket seller asked where we were going, which at first seemed confusing, but since you can buy a combination ticket of a one-way trip on the cable car, then a return trip via the railway back to Grindelwald, it made more sense, as it is cheaper than single fares. Continuing past loads of pylons, the cable car will take you through the forest vegetation and eventually up to more sparsely vegetated areas, crossing what seems to be a relatively small alpine skiing area (compared to what's on the other side of the mountain at least, but more of that later). The view from the station at the top is great, especially towards the west, where there's almost a sheer drop into the small resort of Wengen, from where another cable car has its origin. Further below is Lauterbrunnen valley, and the peak of Schilthorn with the structure Piz Gloria (used in the lesser known James Bond movie 'On Her Majesty's Secret Service') is within viewing range. It is also possible to stroll to the actual summit of Männlichen (2343 m), which takes around 15 minutes. It was a bit cold as the summit was reached, but soon the sun broke free of the clouds and chased away the last remnants of fog that clung to Tschüggen, the tallest mountain of the smaller trio along the ridge that Der Klassiker follows. The gravel path is extremely easy to follow, and the height should not pose much of a challenge. The green pastures on the east side of the ridge is dotted with small water ponds, and there are cows grazing everywhere. Milka cows, obviously - and they are wearing huge bells that make you feel as if you are in the middle of a Glockenspiel! The path continues along the steep slopes of Tschüggen (2521 m), parts of it obviosly cut out of the rock. As you get past this mountain, the full Jungfrau massif comes into view and is at least as stunning as when viewed from Kleine Scheidegg. The path winds its way deep into a narrow valley, which marks the start of one of several possible ascents to the third summit of the ridge - Lauberhorn (2472 m). This is also the start of the famous Wengen downhill race, and indeed the starting area is clearly visible from down below. Lunch was enjoyed at Restaurant Grindelwaldblick (gulasch soup), and it does indeed sport a nice view of the Grindelwald valley with the peaks as well as the Eiger, Mönch and Jungfrau. Once down at Kleine Scheidegg however, it was too early in the day to return already, so we decided to walk further down towards Grindelwald, and jump onto the train at Alpiglen station (1616 m) instead. The road goes down steep slopes near the foot of the Eiger, but might at times be a bit steep for comfort - an option is to follow the more serpentine-like bicycle road instead. From Alpiglen, it is still possible to walk all the way back to Grindelwald, but the road gets even steeper from here on, so we decided to jump onto the train and instead head over to the Gletscherschlucht (Glacier Gorge), some 2 km and clearly visible in the night from Grindelwald, as the hotel-restaurant is well lit, and the nearby cliff wall is flood lighted. Unfortunately, the gorge was closed off due to danger of rockslides (possibly as a result of all the rain during the month), so there would be no stroll inside the gorge this time...pity! For the last night, we had to switch hotel as Glacier was full from now onwards. After a bit of contemplating and checking a big board in the centre of the village which showed the numerous possibilities and whether they had available rooms or not, the choice was to go for the Best Western Hotel Derby. Situated right at the station, we were given a room with a view towards the mountains, but unfortunately the road below was highly trafficked in the morning and therefore quite noisy. Otherwise, the room and hotel was nice, which one would expect at CHF 266. The day itself started overcast..and a bit rainy. No possible trip to Schilthorn (which was the original plan). Instead, we took the car and went into Lauterbrunnental to visit the Trümmelbachfälle, a neat set of waterfalls inside the mountain. After a 'different' elevator ride, lots of steps, twists, turns and passageways, our eardrums were nearly bursting from the deafening roar of the waterfalls inside the caves. 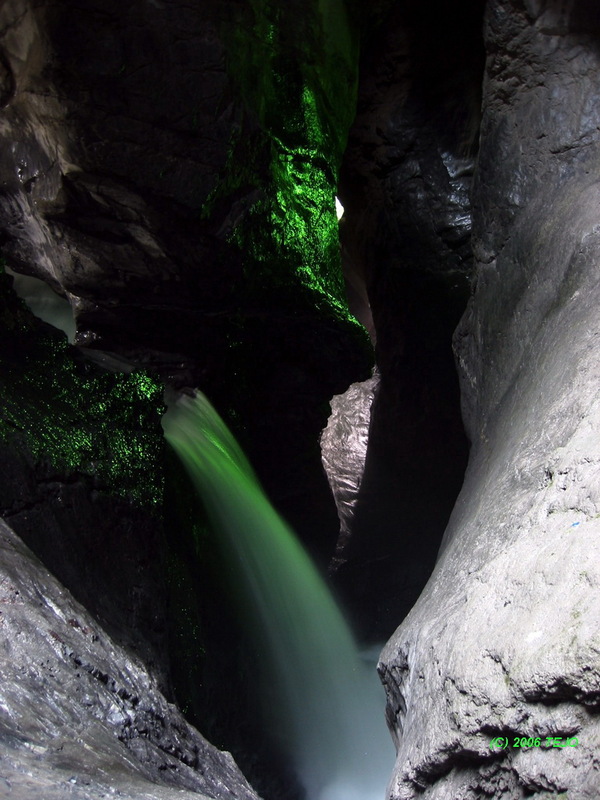 Just nearby the village of Lauterbrunnen, the tall waterfall Staubbachfall tumbles down the mountainside, but it is hopefully more impressive earlier in the year, as this one resembled more of a tap-water-waterfall. We stopped for an outdoor lunch in Interlaken, then continued to the St Beatus-höhlen, a network of caves on the north side of Thunersee. It seemed at times aimed for the younger generation, and was not nearly as impressive as the one we visited in Tuscany in 2005. The outdoor part itself was scenic enough, although parking space was limited due to the terrain. Even though the drive for today didn't seem to be very long when having a look at the map, there is a big difference between autobahns and mountain passes. Back along the Brienzersee, we continued towards Meiringen and tried to see the cosy part of the village, but found none - but saw in the hillside the Reichenbachfälle, a famous place in literature, where originally Sherlock Holmes and his arch adversary Professor Moriarty fight and perish in the waterfall (but due to a massive campaign from fans Sir Arthur Conan Doyle had to revive the master detective in 'The Hound of The Baskervilles'). The chosen road ahead would be towards Grimselpass, a long way up past a couple of impressive dams and eventually into some thick fog and rain. At the top of the pass, I checked if the restaurant was open, but was instead greeted with a closed door and biting cold. At an altitude of 2165 metres, one shouldn't be surprised, even during the summer, as this seems to be an area of very varying weather - one of the stages of 2007's cycling race 'Tour de Suisse' ended up here, and the fog was exactly the same. A short drive further on saw us down to Gletsch (1757 m), a spot in the middle of nowhere where a big hotel was nestled, seemingly out of place. 100 years ago and less however, there was a large glacier running down here, a famous tourist attraction at that time. The Hotel Glacier du Rhône was still open for business, and a nice lunch was enjoyed here. From Gletsch, the Rhône valley stretched for about 45 km down to Brig, but with literally a hundred tiny villages to pass, the drive took quite some time. Brig and its nearly siamese twin Visp were clearly larger towns, and in between these was a huge Carrefour warehouse, a good place to shop for some snacks and reserve lunch. Once at Visp, the road branches off to Saas-Fee or Täsch/Zermatt, and our chosen place of accommodation would be Täsch. At an altitude of 1450 metres, we were greeted by cold rain which was to last for most of our 2-night stay. 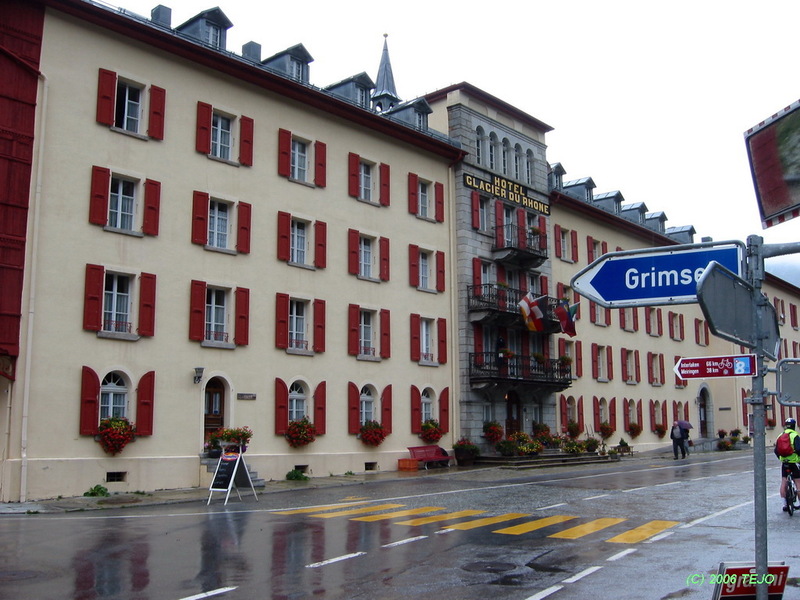 The hotel of choice was Hotel Walliserhof, a nice place but a bit close to the station (where they were doing some major construction work) and the road leading to Zermatt (which is supposed to be car free but heavily trafficked by private establishment owners and workers). Wowow..Klein Matterhorn is clearly visible in the sunrise! Time to head up to Zermatt with the train. This is part of the Matterhorn-Gotthard railway, and its final 170 metre rise is done again with the help of a cogwheel. The first bit of the alpine resort is a bit of a let-down, as building cranes dominate the view. 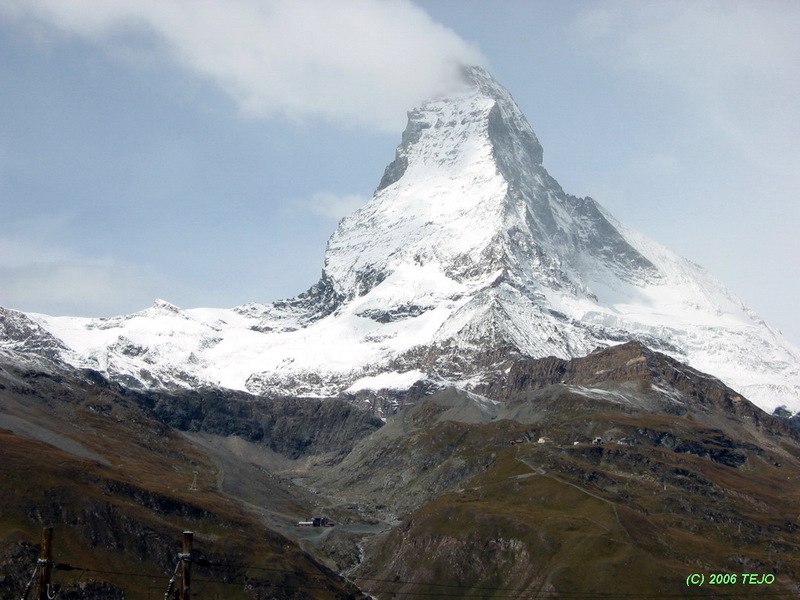 Once outside the naked station, things get better, and the summit of the impressive Matterhorn (4478 m) can be seen beyond a ridge. We decided to take the Gornergratbahn up to 3089 metres, where there is a wonderful chance to view the mountains surrounding Zermatt. On the way up, I was lucky enough to get a shot of Matterhorn in all its glory, although with a not-too-promising cloud right next to it..or it could be snow blowing from the summit as well. Once at the top, it was obvious that the rainfall had turned to snow at this altitude. It was very cold and a bit windy, although some time was given to viewing the 29-four-thousand-metre-peak surrounding the location, part of which is known as the Monte Rosa massif. Three impressive glaciers join to form a massive one at the bottom of the valley. 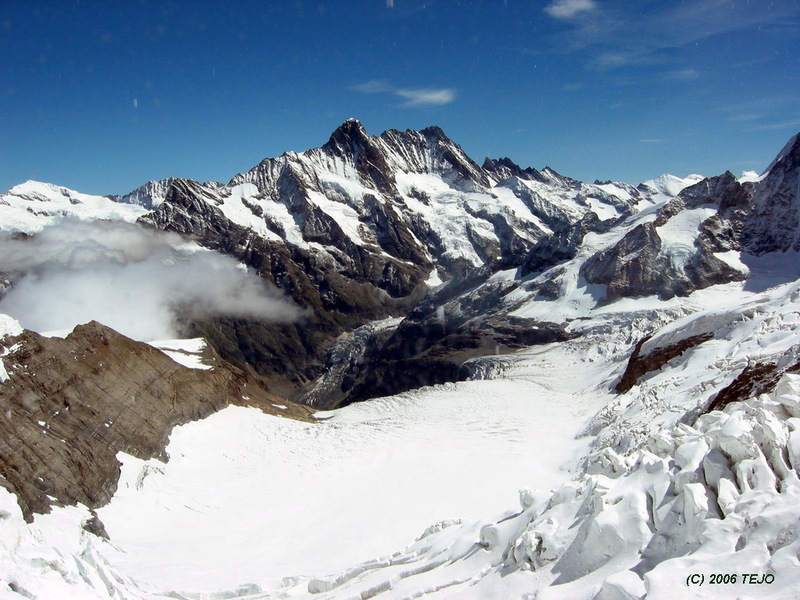 Here, Switzerland's highest peak can be seen (Dufourspitze, 4634 metres). It is western Europe's second highest peak, after Mont Blanc in France. On the way back down we decided to hop off the train for a short while at Riffelalp station (2211 m). Here you have a wonderful bird's eye view of Zermatt, and the station is also a stopping point for tourists who plan to stay at the 5-star Riffelalp resort (which is extremely expensive). A long drive ahead..a quick acquirement of provisions at Carrefour, and we went the same way back up to Gletsch. From here, the Furkapass lead up to 2436 metres altitude, where it seemed as if winter already wanted to take over. Near-blizzard conditions, a lot of fog on the other side of the pass, and a narrow, winding road with little side protection made for a long and arduous drive. On the other side, Andermatt and the Oberalppass was much more pleasant. Yet again past village after village, some with names reminding of the old and possibly dying Rhaeto-romance (Romansh) language (very likely, as it does exist in the canton of Graubünden, which we now were driving through part of). After some 4 hours of driving along winding roads and through countless villages, it was good to find the autobahn and have a relaxing drive for the leg towards Liechtenstein. A quick drive across the river, and we were in the capital, Vaduz. After lunch, yet again gulasch soup (it is good! ), the final 150 km leg to Zürich was done in 1.5 hours - a breeze compared to the previous stretch. We decided the day before not to overnight in Liechtenstein, and it seemed like a good choice, as it didn't seem that exciting anyway - but instead go back to the excellent Mövenpick hotel near the airport. Since the return flight didn't leave until 19:30, we had nearly a full day for possible exploration. After the car was returned, we took the local train to Zürich and strolled along the river and lake, a much more pleasant experience than I had expected the city to be. The weather did help a lot - at this time, summer had returned, and even the snow-capped peaks of the Berner Alps could be seen in the far distance. 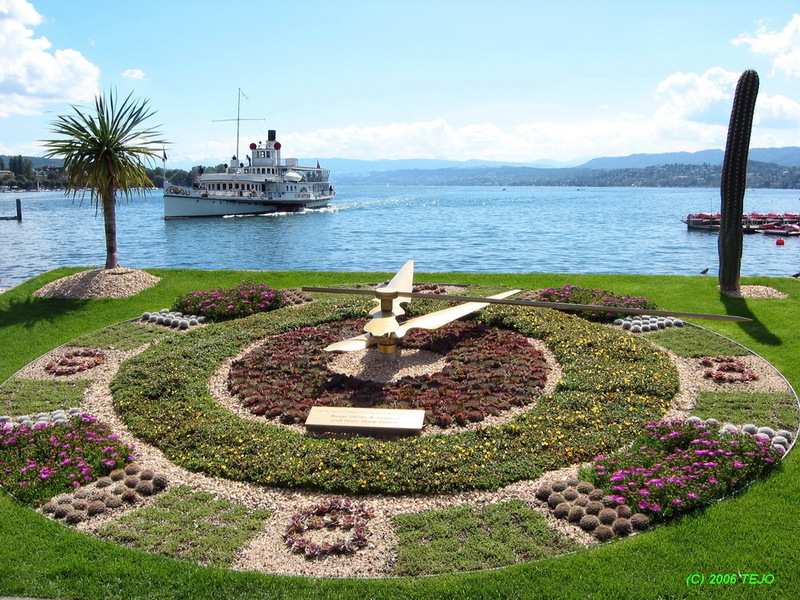 Possible sights to see include the Swiss Landesmuseum (with buildings from various epochs), the Frauenmünster church, the stroll along the lake itself and past a neatly flower-decorated clock on the green lawn, and the fountain in the lake (which isn't quite as impressive as the one in Geneva though). After a bowl of minestrone soup for lunch, the afternoon was spent back at the airport, where one could ascend the roof and watch the planes take off and land. 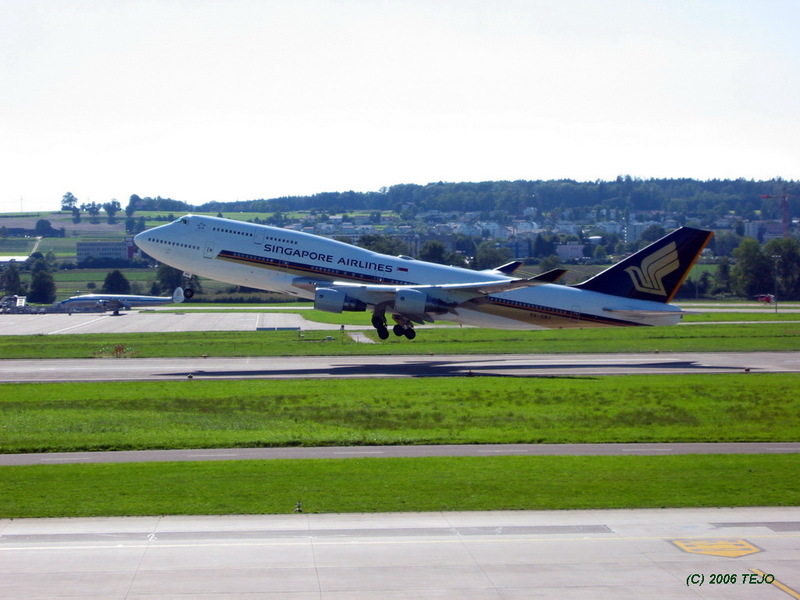 This was an excellent location for 'planespotting', and I managed to get some neat shots of an Airbus 320, an Airbus 340 (both from Emirates), and a Boeing 747 (from Singapore Airlines) as they took off. Time went fast up here, and when we returned back, it wasn't long till the return flight commenced. All in all, it was a very enjoyable trip, despite some unstable weather. But one will have to accept this when travelling in a country laden with mountains. The trip was in fact so nice that a return trip will be made at the same time in the following year!